We are engaged in supplying of Steel Chain Slings of various sizes, quantities and specifications as per the clients’ requirements. Used in general and heavy engineering industries, These are stringently tested for quality before being supplied to our esteemed clients. We also offer Mild steel, Alloy steel & Stainless steel, chain of short link & long link in various road. 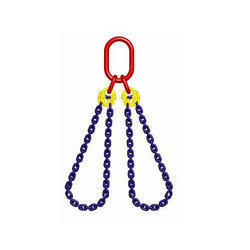 We are also engaged in serving our clients with a superior quality range of Chain Sling. These chains are procured from the reliable vendors of the market, who make sure to utilize optimum quality raw material in the manufacturing process. Tested on various parameters, these chains are developed in adherence with international standards and norms. 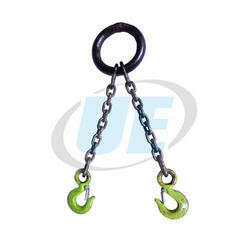 We are actively devoted towards distributing and supplying of a quality approved Chain Slings. Alloy chain slings are often selected when operating under high temperatures or rugged conditions that would abrade or destroy other types of slings. They are flexible, durable and long lasting, ductile and easy to inspect. Although chain will show little or no stretch at rated capacity, it does have the ability to elongate up to 20% prior to failure. This elongation serves as a visual warning sign prompting users to remove the sling from service before injury or damage is sustained from a broken chain sling. 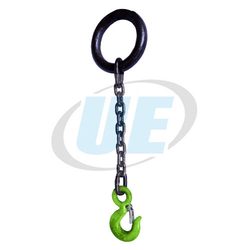 We are leading manufacturer of chain sling as per customer requirement like ring on Top hook at bottom, Hook at both end, Ring at both end and many more as customer design and his required capacity. 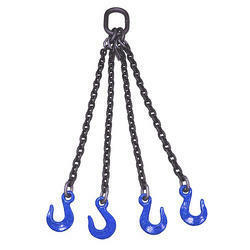 We looking buyer of Single legged Chain Sling from all over India. We are leading suppliers and manufacturers of Chain GR-80 Alloy Steel. The offered chains are designed for lifting, such as when used with a hoist; for pulling; or for securing, such as with a bicycle lock, have links that are torus shaped, which make the chain flexible in two dimensions. These are designed for transferring power in machines have links designed to mesh with the teeth of the sprockets of the machine, and are flexible in only one dimension. They are known as roller chains, though there are also non-roller chains such as block chain. Wire Rope Slings shall be mfg. As per is-2760/1980 in general. We supply a wide range of wire ropes extensively used in various industries for different applications. Fabricated from top quality raw material, the ropes are widely appreciated for durability, tensile strength and its ability to withstand any weather conditions. 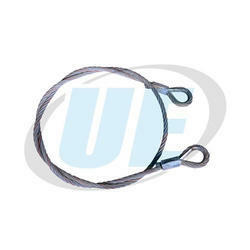 We also supply wire rope slings widely used in various industries including automobile, construction, textile and steel. Designed to operate under high temperature and rugged conditions, these are available in various sizes to suit the diverse requirement of our client. 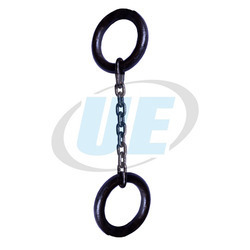 Our clients can avail from us a wide range of steel made chain slings as per is standards. Known for the features like robust construction, flexible and corrosion resistant, these slings are extensively used by our clients. We also provide customization facility to meet the specific requirements of our clients based nationwide. A double leg chain sling (also called a 2 leg chain sling) is comprised of two lengths of single leg chain attached to an oblong at the top. Fittings of your choice at each bottom end. 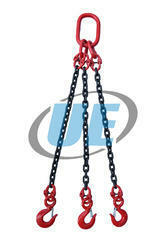 Double leg chain slings offer higher work load limits and improved load stability for overhead lift applications. Two pick points also increases its versatility. 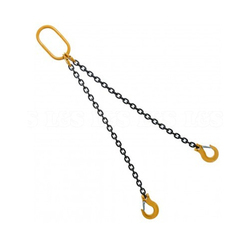 We are offering 4 Legged Chain Slings.